In the last 12 months, the world has come hear more about Sierra Leone this time not about war but about Ebola. Between 1991-2002 Sierra Leone was in the for its brutal civil war. Later, it was it’s success in coming to peace. Elections were held and some resemblance of stability was recorded. Mr Tejan Kabbah, the 3rd President of Sierra Leone led that country between 1996-2007. His presidency was dogged by the civil war until 2002 when the was was officially declared over. Expectations for that government were high, at the same time, trust was low. The peace and reconciliation commission was working. The human rights commission and other state institutions were being quickly built. Perhaps difficult to resolve was the high unemployment rate. Sierra Leone coming out of war had lost the best of its working force to bullets and a lot more ending up as refugees outside their country. More important to note is that thousands if not millions had their education interrupted and many of the people on the streets of Sierra Leone do not have the right training or capacity to help effectively run the state. The economy could not meet the wage expectations of returning professionals. While many young people have lost 5-10 years of their lives as soldiers or people on the run. It’s this group – the youth that has proven difficult to win over. They were promised jobs, income, healthcare etc but that did not have the education to be hired. Instead, many of these young men and women who were powerful militias and rebel leaders and terrorised their fellow county men and women suddenly became powerless and vulnerable. The Kabbah administration did very little in either harnessing or redirecting the energies of the young people. To appease them, they were offered short term projects such “money for work scheme” where young people were asked to de-silt gutters, fill potholes, construct community bridges or roads, etc. It is not that these kinds of jobs are not worth it, it is that, they were not planned in a way that added value to the lives of these young people. Second, they were paid just enough so they could come back the next day. Party henchmen got these contracts and sublet to the youth. There was little effort to link the little the government was doing to its development plan. Much of the projects and plans were only short-term quick fixes. Finally, the money being used for these projects were donor grants, some in fact were loans. Essentially, the Kabbah led SLPP was mortgaging the future of these young people for nothing. The first 5-years (2002-2007) post war went by quickly and Mr Kabbah’s Vice Solomon Berewa lost the election to Mr Ernest Bai Koroma of the APC Party. My first visit to Freetown was June 2011, I had one mission – perform a reconnaissance of Sierra Leone in other to make the decision of whether it was safe to expand our internship programme to that county. “Sir, I think your government has done well and Sierra Leone currently has the feel of a jumbo jet all fuelled and on the runway, ready for take off, yet the jet was taking too much time and running out of runway…if you win this election and don’t get out of the election mode quickly, your county might crush”. For 1 year post 2012 election the country was silent – economically and financially – money was spent on election campaign and very little was available to perform the real work of governance. The only spending happening was the multi billion not-for-profit sector. Wages are not being paid and suddenly, a party that just won an election was back in election mode as Mr Ernest Koroma tries to set himself up for a third term! While things were still being “figured out” – something tragic happened – it was not the economic and political “crush” I mentioned in my conversation with Mr. Kamara. What happened was EBOLA! . That “crush” I spoke I predicted (or attempted to predict) was what I saw as an uprising due to increased economic hardship but Ebola exposed the government. Indeed Ebola was more than a health crises, it affected every fabric of society – transport, agriculture, banking, health, etc . No one was ready, no one knew what to do. Even as the first few cases happened in the interior, the APC Party was still juggling the term elongation plan. This is how the APC Party plunged Sierra Leone into the current state. Ebola became endemic because those that were the guardians of the people were busy seeking leverage for themselves. Non-Governmental organisations and other state institutions did not know what to d because the lead institution – the Government of Sierra Leone (GoSL) could not provide clear, direct leadership on the crisis from the very beginning. 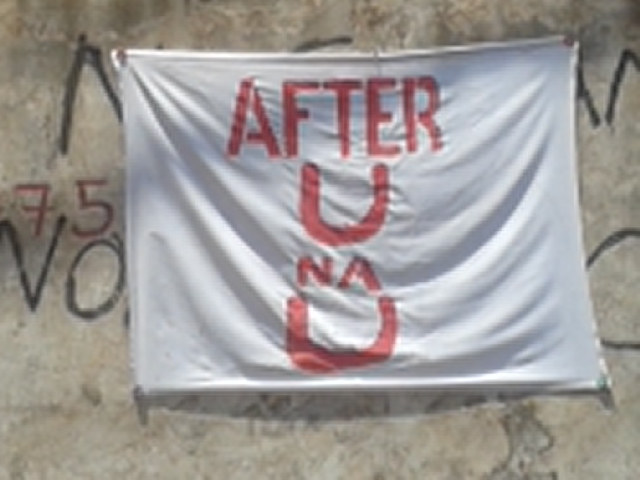 April 2014, I was in Freetown and the new slogan in town was ‘After U, Na U’ – to wit, “Mr. Koroma will be replacing himself in the next election”. In the meantime the ebola associated deaths have started. Radio, television and newspapers were focused on discussing the “third term agenda”. Civil society was silent, the opposition party developed their counter slogan: ‘After Gbabgo na U’ – reminding Mr Koroma that he could end up as Mr Gbabgo had – in the ICC Prison at The Hague. But all was not well in the Party. The APC Party was itself divided, there was the group routing for Mr. Koroma, a second group supports the bid of the current Vice-president to take over from President Koroma. A final group purported to be led by former chief of staff Dr. Richard Kontey opposed both the President and his Vice-president’s bids. Throughout the Ebola crises, we have seen little collaboration between the office of the President and his Vice-president. The effect has been the delay in performing situational analysis, needs assessment and to find the right local and international partners to form the right team to tackle the crisis. For this lack, we saw the needless death of more than 3,000 people – children, women and other vulnerable people. Report of the Sierra Leone’s Audit Service shows that a third of the Ebola funds – $3.3million during the period May-October 2014 could not be accounted for. The audit showed huge mismanagement of funds by individuals, state apparatuses and leadership of Non-Governmental Organisations. The Audit Service is yet to report on November till end of year 2014 and the first quarter of 2015. The report also focused only on funds coming to the GoSL only. I think a wider audit of International Organisations will show even more massive mismanagement of funds. In neighbouring Liberia the case is not different BUT one thing was clear – they fought to come to zero. One would expect that Liberia achieving zero ebola cases motivate Sierra Leone to work differently. But No! Just this month of March, the political crisis has again over shadowed the Ebola crises in that country. During the absence of President Koroma to attend a donor conference in Brussels, the APC Party decided to expel the Vice-president from the Party. Currently there are rumours of a parliamentary process to impeach him. The key issues facing Sierra are many and varied; youth development and youth unemployment, healthcare, fixing the Ebola ravaged economy and the post Ebola problems with education and social cohesion. But the government, it’s leadership and the party think otherwise. Why would they (Sierra Leone) behave so childishly? Because there is the availability of free or cheap donor money, grants and loans? The economic community of west African states (ECOWAS) and other agencies have called on the global north for debt forgiveness for the Ebola ravaged countries. I do not think this is the right time to give access to more loans or grants to the government of Sierra Leone. Any money at this time will only increase the fluidity of the political crisis. It appears that access to funding outside of taxes for Sierra Leone and other West African countries continuously and consistently have made these governments to fail their people. Their role in government has not been about the people or how to build on the good of their countries but rather to plunder. Perhaps it is time for donors to rethink their grants mechanisms and support small, credible grassroots organisations. We have seen during the Ebola crisis how small organisations have worked better than the big international foundations; we have recorded zero grassroots organisations negatively indicted in audit reports. It is time to back to the 90’s funding mechanisms and support directly the efforts of community based, people centred organisations. Governments in the West African region have proven, time without number that they can not be trusted with development grants for its people. On that score, Sierra Leone and Mr. Koroma have failed massively.